We got Zada from the local Shelter in mid-June, almost immediately after our return from a long holiday. Our previous dog had died quite suddenly in March, and, though I knew I couldn’t “replace” him, I was very anxious to have another dog, and have had good luck with rescue dogs. 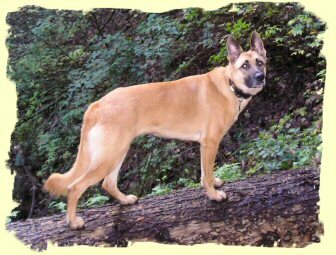 The Shelter said Zada was a German Shepherd cross (though most now think she is a Malinois cross, but that’s close). They could not provide us with any information about her history or temperament, since they are a stray-only shelter. They did say that they thought (erroneously, it turns out) that she did not have a high prey drive, on the basis of some tests with a tennis ball. At any rate, Zada seemed sweet to me, didn’t pull much on the leash, and let me examine her feet and mouth no problem. Plus, she had beautiful dark eyes, attentive pointy ears, and an impressive black-tipped coat, and looked to be an ideal companion for running and hiking. She immediately bonded to me and absolutely adored my partner, Phil. She took more interest in the cat than I would have liked, but that was under control, she was not too much trouble to walk on-leash, she mostly played nice with other dogs, and she generally came when called when off-leash if there weren’t too many distractions. Sounds fine, right? Wrong. There was one huge problem (along with some less serious ones, to which I’ll return). Zada was having difficulties adjusting to an important aspect of life with me—being well-behaved in my office. I am fortunate, where I teach, to be able to bring a dog to work. However, the dog must be calm and accepting of a variety of people in the hallways and of students coming into my office to speak with me. Zada was not. I brought her up to school five or six times in the first while I had her, with the goal of getting her used to the set-up before classes started. 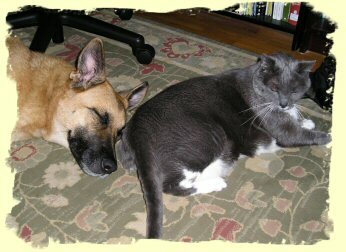 My previous two (large, mixed-breed, rescue) dogs adapted without a problem, and that was when term was in full-swing. But they were, to an extent that I can appreciate only in hindsight, just naturally laidback. With Zada, each visit was worse than the previous one, with her eventually growling or barking at nearly every noise and presenting as quite aggressive when the odd brave grad student would come by to see me. Also, she would cry piteously when I left her alone in my office, which was not fair to my colleagues. Let me add that we had started obedience classes (not Jeff’s! ), but they clearly were not helping. 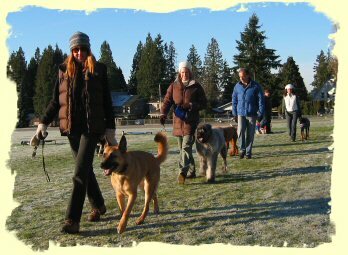 The classes consisted almost entirely of the instructor talking about things while we, the dogs and owners, stood around. Zada and another dog in the class were having staring contests accompanied by protracted barking that was just getting worse. Things were going downhill. Furthermore, the instructor actually seemed frightened of Zada. I was starting to despair—if she weren’t able to accompany me to work by September, then I’d have to leave Zada at home (not an option for most days) or leave her at doggy daycare (if they’d be willing to have her) or kennel her. None of those alternatives was appealing; if I couldn’t bring Zada to school, then we’d both lose out. I was thinking that surely there was a dog out there able to take advantage of the perks I could offer, and it seemed crazy to contemplate making large monthly payments for Zada’s care when that money would be better donated to the Shelter. I was almost certain that I was asking too much of Zada, given her breed, history, and temperament, and I was on the verge of taking her back. I had told the Shelter when they asked that there were two conditions under which I would return her—if she were unable to get along with my family, including my cat, or with my students. Zada was clearing the family hurdle (with some effort), but things looked bleak for the student hurdle. I decided I needed to make one further attempt. 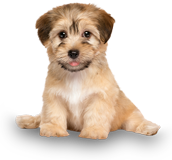 I’d seen the “Sit Happens” van at our neighbours’, who have a lovely purebred German Shepherd who was, at the time, just a puppy. I liked how well he was turning out, though I did think to myself, so what? 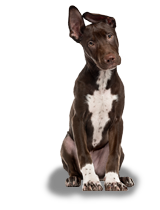 Zada had none of the benefits of such early training, good breeding, and loving ‘early childhood’ owners—how could Jeff help? But I felt I owed it to all concerned to get in touch. So I sent him a lengthy e-mail, explaining the problems and asking for his honest assessment of the prospects for Zada with us. Half an hour later, Jeff called. 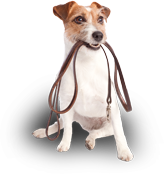 He was willing to come over to assess the situation, no cost and no obligation. When he came to the door, Zada did her best spazzy guard-dog thing, and I did what I now realize was seriously facilitating of such behaviour, but Jeff was unfazed. He came in, Zada calmed down, we talked. Then Jeff gave a demonstration, on the street in front of our house, with his own Malinois, Jazz. That was so impressive. But even MORE impressive was his work with Zada. He was patient and respectful, and his love for dogs was obvious. (Zada absolutely adores Jeff.) She really responded positively, and Jeff said he thought she would “clean up nice.” He was willing to work around our schedule, cognizant of the fact that we needed some sort of resolution before classes started (and that we were going away for part of August). We signed up on the spot. I said I’d come back to the other problems. (If you’re still reading, I admire your tenacity!) Let me list some of those before turning to what happened when we starting training with Jeff. * Zada has an extremely high prey drive, coupled with a tendency to herd. When we got her, if something was small and moving fast, she was after it. That’s okay if it’s just squirrels in a safe environment (she doesn’t catch them), but not okay if it’s squirrels wherever they might be seen (e.g., across a busy street) or small dogs or cats who don’t want to be chased or herded. * Zada was (and is!) very fond of my partner, Phil. However, before we started training with Jeff, she was *too* submissive to Phil. If he were to let her in from, or out to, the backyard when I was not home, she would often “widdle” on the stoop or the kitchen floor. * relatedly, Zada was reticent around strange men. She was quite quick to cower if a man she didn’t know were to raise his hand or to move quickly. * Zada was extremely needy of interaction with us, constantly pawing or otherwise seeking approval. * Zada was ball-obsessive, making playing fetch with her a nerve-wracking and unpleasant experience. * finally, Zada was just generally too protective, prone to nervous and barky reactions around strangers or in new situations. Okay, back to how things have turned out. Well, we still have her!!! And *we* are happy and we are sure that *she* is happy, too. She comes with me almost everywhere, including school, where she is well-behaved. Jeff taught us how to crate her, which was surprisingly easy (though I would love to have a video of that first attempt… ha ha!). She is now often happily relaxing in her crate at school, even when I haven’t told her to be in there, and she goes straight in and settles right down when told. Crating allows me to manage her during office hours—she feels little or no need to act protective, and I have no concerns for my students. My diagnosis is that she really needed to feel confident that I am in charge. She now knows what is expected of her and is happy to oblige. I have been especially impressed with her calmness in the elevator—she’s been fine with an elevator full of chatty students, with audio-visual carts being rolled in next to her, and with a motorized wheelchair entering that confined space. She looks to me to see how she is to react, which means she stays calm. Also, she no longer cries when left alone in my office and just generally seems to have found her place in the world. Outside, she is also much easier to manage. She heels when instructed on a loose leash (or no leash at all) and her recall is essentially flawless. She still has that high prey drive, but, if I see something that interests her at the same time she sees it, I can almost always get her to heel before she starts the chase. If I see it too late, I can quickly get her back to a heel. (She is a work in progress, but what progress there has been! 🙂 She was already usually fine with other dogs, but now I know that, in those cases where play looks too rough or focused, I can quickly get her to pay attention to me instead. The “let’s go” command really helps on our off-leash walks. As to the widdling around Phil, that has stopped. She adores him still, but never to the point of incontinence! She has, as Jeff predicted, cleaned up nice. She is still herself, but much happier, and we can now manage any tendencies that need managing. We really enjoy our outdoor classes—they’re actually fun and we always learn something. We could stop attending, but she has so much potential, it would be a waste not to continue to explore it. Perhaps in the future we will try agility training. Thank you so much Sit Happens, for helping us to do right by Zada and to make her a happy companion instead of a worrisome burden.